Just a quick thank you for putting on such an interesting, thoughtful and educational day yesterday. Both Craig and I got a great deal out of it and it gave us many ideas for the future. Also the food and tea/coffee provided at each venue was much appreciated as well. Again, thanks for a great day. As an evolving continuation of last years very successful Sustainable House Tour Lisa Yeates and I decided to run the day again. 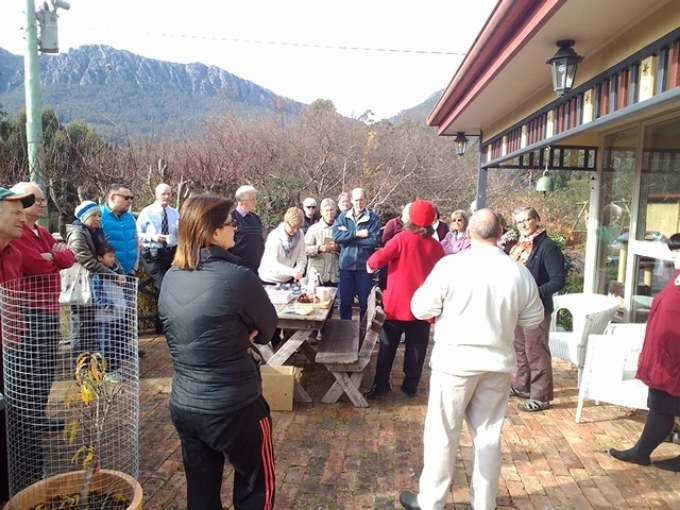 This time we opened three homes in the Kentish region in North West Tasmania, under the craggy Mt Roland.Last year we only asked for donations. This year we charged a set fee per home with discounts for multiple bookings and couples. This was all bookable on line through http://www.diyeco.com.auThe day was a great success with all three homes almost booked out.The three homes were very different so offered people choice. One was an owner built strawbale, the next had installed lithium ion phosphate battery bank as a stand alone solar set up, and the third was an all round well designed and built solar passive home.The very cold morning, around zero, showed off the impressive insulation qualities of strawbale with the inside temperature of the house being 17c without any heating on.,Feedback was extremely positive and Diy-Eco looks forward to running another very soon.